Interns with Symantec nonprofit partner YearUp are matched with professional mentors as part of the organization’s program to empower professionals from diverse backgrounds and close the “opportunity divide”. YearUp interns visit Symantec during the kick-off the Symantec’s involvement in Year-Up’s mentor program. Interns will gain six months of guidance from mentors, with many continuing on well past this. For others, such as those from non-traditional backgrounds, this may not be the case and can be something that holds them back from realizing the opportunities they can pursue. However, by providing guidance, we can change this and help professionals of all backgrounds channel their skills, strengths and expertise to make the most of their career now and into the future. A partner of Symantec’s flagship corporate responsibility initiative the Symantec Cyber Career Connection (Symantec C3), YearUp is one organization looking to bridge this “opportunity divide” by “enabling young adults to move from minimum wage to meaningful careers in just one year”. YearUp’s mission is to create “a future in which every young adult will be able to reach their potential”. A leading educational nonprofit, YearUp provides urban young adults a variety of personal and professional development resources to empower them to reach their potential through professional careers and higher education. Focusing on both personal and professional development, a key offering of YearUp’s program is mentorship. 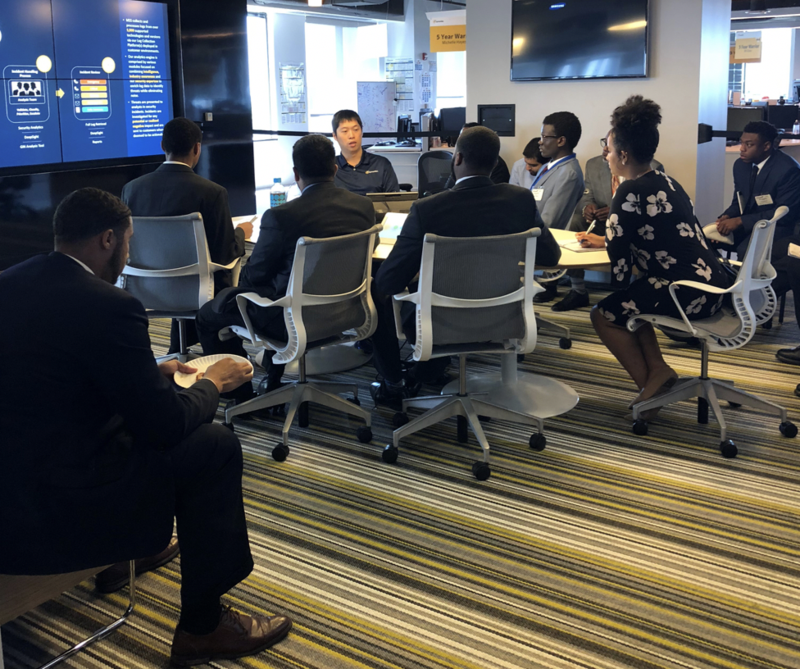 Symantec’s Herndon office is now taking part in YearUp Baltimore’s mentorship program, to provide industry relevant mentors for cyber security students enrolled in the program. Approximately 20 interns are participating, with four at our Symantec office and the remaining at companies across Baltimore. To ensure interns are matched with professionals in their field, there is flexibility to mentor either in person and/or virtually. Additionally, through monthly mentor hubs, mentors will share best practices and experiences to continually improve the mentee experience. I am excited to be working with Sade, a YearUp intern working at Oath (the umbrella company for Yahoo! and AOL). As YearUp states “mentorship is an especially personal way to impact a young adult’s life”. I am grateful to be a part of this program, and extremely passionate about it, because it is giving people a new away out. I hope to build a partnership that extends well into the future helping Sade as she navigates the many challenges and opportunities of building a career. In the past I don’t think you would have seen a company mentoring employees from another company. However, today companies are moving from a “me to we” mindset and recognize that long-term business value will generate from a strong industry, resilient communities and a pipeline of talented professionals. Additionally, so many of us have the preconception that we have anything to offer, however mentoring is an extremely flexible volunteering commitment that anyone can take part in – either in person or from your place of work, home, or both. All you need is your expertise, skills and most importantly dedication to share what you have learned. For myself and Sade, I hope this is just the start and I can continue to guide and help her for years to come. I hope others will think about how they can do the same. If we can learn from others, and then impart that wisdom back to those around us, think about the impact?